The talented Lamya Gargash is a friend and relative. Yet, before the opening, I didn't benefit from my close relations to "look through" her latest art, as the title of her show at Third Line "Through the Looking Glass" suggests. And in writing this blog, I didn't open the mirrored-like booklet that showcases her stupendous diptychs, nor did I read the analysis, so that I can write this blog un-influenced. I also didn't ask her to explain, as I never do when I meet the artists. In fact, and always to the astonishment of the various artists that I meet, I pour upon them my open ended questions just to share my own interpretations of their art. In this post, I will inform you, dear Lamya, of my immediate impressions of the art show. For the other readers, a small synopsis of Lamya Gargash's art is de rigeur. All her work is quintessential because her photography, and that is frequently her medium, has a recognisable signature. She has captured shots of architectural interiors and exteriors that are kitsch in a certain sepia 70s mat finish that convey an ambiance of derelict hotels, empty bedrooms, abandoned gardens, retro finishes. When we spot places that resemble them we point to "a very Lamya Gargash interior". When I take a snapshot of an abandoned sofa on a street curb it also reminds me of her: it is me mimicking a photographer I admire. I once found her working on a Louis Vuitton project and even then, commercial as the project may have been and most probably with certain guidelines, her signature style could still stand out. She had put characters carrying Louis Vuitton bags in their setting. In this case, her famous interiors, supermarkets and movie theatres, did not compete with the characters. Her photo is staged, yet natural at the same time. 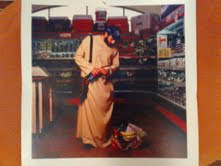 I go to the supermarket and take portraits and call them "Lamya Gargash" photos. When I took my younger kids to Third Line, they were responsive to the art because the diptychs, especially when viewed as a collection, lend to interaction. The artist did pull us "though the looking glass", children and adults. We gazed at the dyptichs and were amused! I took my children through it and they laughed at the single difference between the conventional portrait and the not so conventional. The frontal portraits gaze at the onlooker in confidence and confront him with a "what are you looking at? The difference between me and my twin image? Is it really a difference?" Besides the difference is intentionally "fake" and masqueraded, a la Hollywood movie make-up accessory. Small eyes, large chin, funny eyebrows, dangling triceps, stretched ears lobes. My favourite piece in this collection is the self portrait first because its genre is on top of my list. 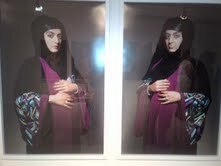 Furthermore, Lamya Gargash adds humour by allowing herself a metamorphosis in the twin image of herself. Indeed, she chose her own image to add the extra "ageing" makeup. The fact that she took a picture of herself expecting child is not fortuitous. 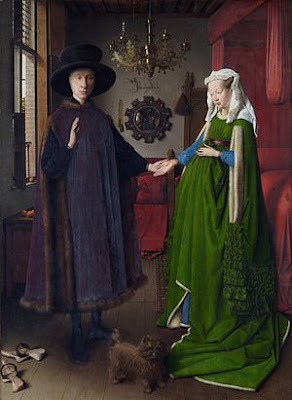 It is a direct allusion to the Renaissance painting: Jan Van Eyck's Arnolfini "Wedding" Portrait! Like Van Eych in his times, Lamya Gargash is stepping beyond the boundaries of culture by addressing the issues of appearance. She has portrayed herself in this collection, personalising the theme of reality/fantasy, colouring it with creative humour. She certainly is the ambassador of a movement called "the edge of Arabia." I heard about photography and video art becoming valuable only few years ago from a friend who just came back from Basle.Though I have been an amateur photographer for decades and have so many of the family photos I have taken at my friends' homes,I still can't comprehend the value od boring videos churning on in art fairs.